Dating cymbals is notoriously difficult. 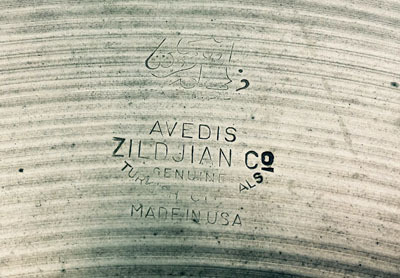 While other instruments have incorporated date stamps and serial numbers for years, a working date system wasn’t put in place at Zildjian until 1994. That leaves around six decades’ worth of cymbals primarily identifiable by one thing: the stamp. While other factors like lathing concentricity and hammering patterns can assist in divining the age/era of your cymbal, the most accurate way to know whether you have a crash from the ‘70s or the ‘40s is a close study of the famous Zildjian stamp. If you haven’t already, we recommend reading through our article on the history of Zildjian cymbals to understand the breadth of the company’s past. 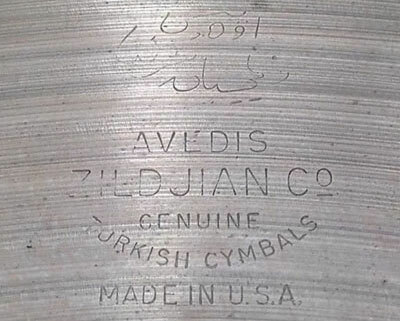 For the sake of parsing through a reasonable amount of information, this article focuses on the history of A. Zildjian cymbals. 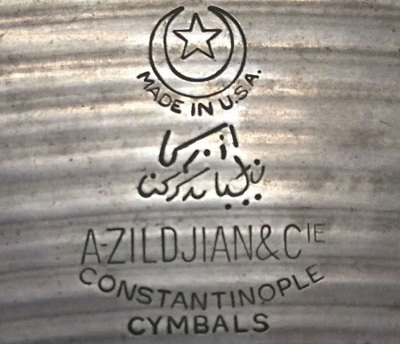 The stamps of an A. Zildjian cymbal are comprised of two parts: an upper section in Arabic and a lower bit in English. The Arabic portion is the key element in identifying older models. 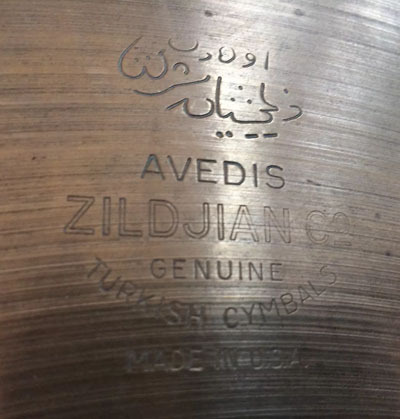 Translating to “Avedis Zildjian Company,” specific anatomical points called the “three dots” (which will be described in greater detail) are instrumental in divining the age of a cymbal. The earliest uniform stamp identification was put in place in 1929 at the Zildjian factory in Massachusetts. These early models are easier to identify thanks to the hand hammering, wider lathing, and generally more worn appearance due to their age. That being said, there are obviously exceptions of well-preserved specimens, some of which have even retained their ink logo through the years (it’s a common misconception that early models weren’t inked). The First Stamp is defined by a cruder, less uniform engraving and the presence of the famous “three dots” on the bottom of the logo. There are two renditions of the First Stamp: one with wider lathing and a more rounded “J” figure, and another with more pronounced embossing on the edge letters similar to the Trans stamps. 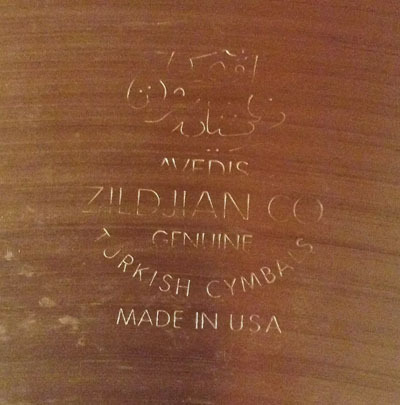 Finally, Zildjian also produced cymbals for Ludwig, Leedy, and Slingerland under the names Zenjian and Alejian. These cymbals were in included in entry level drum packs. The Trans stamps marked the “transition” in the company’s production of less uniform stamps to a more standardized, even logo. Three main factors define Trans Stamps: the absence of three dots on the bottom of the Arabic lettering, the exact size of the stamp, and the deeper embossing on the edges of the stamp. Trans stamps will measure either 1 ⅛” or the rarer 1 3/16”. A measurement of the stamp will provide the most accurate information. As the name implies, the Large Stamp is the biggest stamp ever produced by Zildjian. While these can be confusing because there are models with and without the three dots, there are two easy giveaways when identifying Large Stamps: a hollow block “Zildjian Co” with a more detailed engraving and/or a stamp size of 1 ⅞”. Not all Large Stamps will feature the hollow block logo, but they will all measure 1 ⅞”. While it’s easy to assume this is the smallest stamp Zildjian ever produced, this era is known as the “Small Stamp” because of the stamp’s size in relation to the Large Stamp. The Small Stamps are defined by the absence of the three dots and a size of 1 ¼”. 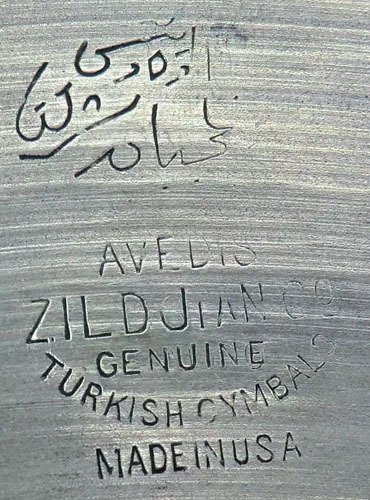 It should be noted that Zildjian began machine hammering their Avedis cymbals through the late ‘50s and early ‘60s, so identifying via hammering patterns isn’t as reliable for this era. Used consistently through the whole decade, the stamps on models of this era are much easier to identify. In addition, Avedis models were uniformly produced in machine hammering by the middle of the decade. 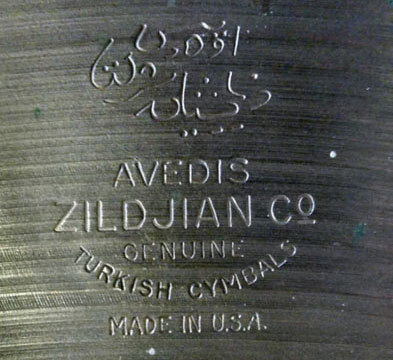 ‘60s Stamps are defined by a bold “Zildjian Co” embossing, three dots in the Arabic logo, and a size around 1 3/16”. Models from later in the decade featured a stamp size of 1 ½”. The ‘70s Stamp is also referred to as the “Thin” Stamp because of the light embossing used at the time. This thinner stamp makes ‘70s models easier to confuse with the stamps of the ‘50s, but can be identified by the non-bold “Zildjian Co” logo, 1 3/16” stamp size, and uniform machine hammering. These unusual specimens were specifically used by Zildjian when they began producing brilliant finish cymbals. The inclusion of “Constantinople” in the title understandably leads some to assume these models are Ks, the machine hammering and uniform finish are easy giveaways for identification. In addition, CO models feature a 1 ⅛” stamp size and stand a better chance of retaining an ink logo thanks to their more recent production. 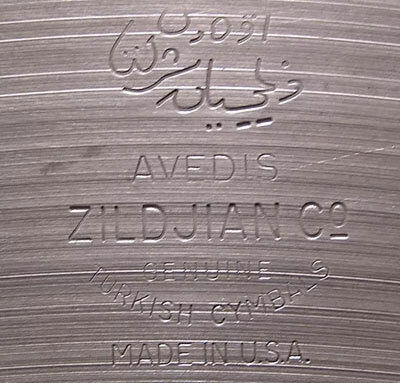 Beginning in 1994, Zildjian introduced a laser-engraved serial number on the bottom of the stamp for easy identification. The two letters at the beginning of the numerical sequence distinguish the year.